Welcome back! Thanks for checking out this week's meal plan. For those of you who are new, the next few paragraphs are about my plans and some friendly reminders. You may want to check those out along with my tips for Pinterest meal planning and list-making on Google Keep. For those who have already read these reminders, scroll down for week twelve's fabulous recipes and grocery list! Loaded with fresh ingredients and packed with health, this week's meal plan is one you can feel good about this holiday season! For those who are subscribed to my newsletter or following me on facebook and twitter, you already know about my latest blog series, My RA Story. If you have not subscribed or aren't yet following me on social - you totally should (links below). You'll get the latest on my posts but also super awesome posts and videos from some of my favorite sites and bloggers! You'll also be the first to know about an upcoming free accountability group on Facebook which is perfect heading into the new year! The reason I bring up My RA Story is because, now that I'm almost five months postpartum, my rheumatoid arthritis symptoms seem to be making a comeback. My gut reaction (pun intended) is to take care of my gut and get my eating habits back in check. This means limiting gluten (or going gluten free once I'm done breast feeding), and loading up on nutritious and anti-inflammatory foods. This week's menu plan is focused on getting loads of fresh fruits and veggies so I can up my energy and keep up with my baby who is becoming more and more active by the day! Super simple yet packed with flavor. Gaby's Brussels Sprouts salad is the perfect way to start off your week and beat the Monday blues! Oh, and if Meatless Monday is your jam, then this one's DEFINITELY for you! 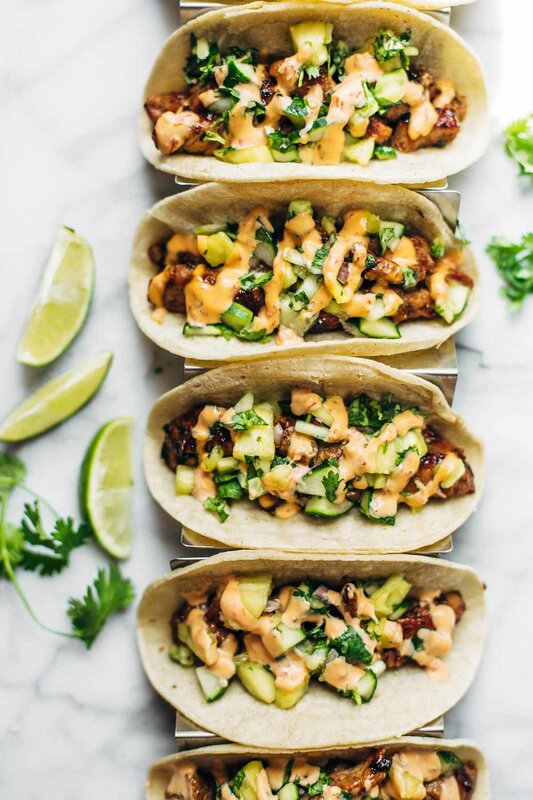 Never was a Taco Tuesday more glorious... Lindsay over at Pinch of Yum knocks it out of the park with this super quick and easy pork taco recipe! YUM is right. Make up some extra pork (or chicken on Thursday) and save it to load up Friday's sweet potatoes! A simple and delicious easy weeknight meal is a great way to get your veggies in! Make use of some leftover kale from earlier in the week and make these easy stuffed cabbage rolls! This hearty comfort dish is perfect for hump day! Check it out now in our recipe section! Limit food waste by keeping ingredients consistent throughout the week! This easy and delicious Cajun Chicken with Mardi Gras Salsa is the perfect way to use up some of the ingredients from earlier in the week! Photo credit & permissions from Kristin at Iowa Girl Eats. With practically the same ingredient list as Tuesday's Tacos - this is a great way to use up all of those goodies and not let any go to waste! Kristin at Iowa Girl Eats never disappoints. Don't forget to do up some extra chicken if you're planning on using it to load up tomorrow's sweet potatoes! Easy, delicious and packed full of sweet potato and kale nutrients! The perfect end to a healthy week! Enjoy a nutrient-rich end to your week with sweet potato and (more) kale! Seriously, I can never get sick of kale or spinach because it's so easy to mix these greens into practically anything and get a totally different dining experience every single time! Take some leftover pork from Tuesday or chicken from Thursday and use it to load up these filling sweet potatoes! Another bit of dinner inspo from our recipe section.